Last week, Rollins interfered in the match between Owens and Reigns. Also, Rusev attacked Reigns after the main event. Roman Reigns makes his way to the ring. As he starts to speak, Stephanie McMahon interrupts and heads to the ring. As she is about to talk about her plan, Mick Foley interrupts and heads to the ring. Foley takes the blame for the interference last week, and he says that he will put the perpetrators, Rollins and Rusev, in a match this week. Reigns wonders what good that does him. Foley tells him that he has a US Title match at Clash of Champions. Foley also defends Stephanie’s honesty, as well as his own. His word is his bond. To make things right, Foley puts Reigns in a rematch with Owens tonight. Stephanie seems dubious, but Owens comes out before she can speak. Owens is upset. He already beat Reigns twice last week. Steph says the match tonight won’t be for the title, but Foley says it will be in a steel cage. Then Seth Rollins comes out for the first match of the night. Steph seems upset about Foley’s decision for a steel cage match six days before the champ has to defend his title. Rusev is also upset with Foley for giving Reigns a US title shot. Rusev has figured out Foley though. He’s jealous. Foley doesn’t care what Rusev thinks. Foley then answers a call from Chris Jericho. It’s interesting watching Rollins wrestle completely as a babyface. He did that in this match. I love that WWE is open to this kind of matchup. Both of these guys are in feuds that blur the lines of the traditional “babyface vs heel” match that WWE has historically almost always adhered to. The wrestling was good in this match. Not great, but good. The finish was obvious well before it happened. The after-match shenanigans were fun, but it didn’t make a lot of sense for Rollins who is usually very calculating with his actions. He went almost too babyface in this match. Dana Brooke narrates video footage of Sasha and Bayley both having their shoulders down last week. Foley thinks Dana has a great idea. A triple threat match on Sunday. Charlotte is not happy. A video package featuring Cedric Alexander and Brian Kendrick. Jericho and Owens are upset with Mick Foley. Jericho is going to make a list of everything Foley has done wrong as GM. A little longer than a squash, but not much different. Bayley is excited about being in the ring with Sasha on Sunday. Sasha isn’t as excited, but she’s up to team tonight. Good match. Charlotte and Dana worked way better as a team. Sasha and Bayley barely tagged, and that led to the finish. It makes sense and adds intrigue for the PPV, which is good. The Memphis Grizzlies are at ringside. Rollins is confused. Why did Triple H choose Owens? Steph says that maybe her husband was tired of Rollins ruining his reputation. Rollins might be Steph’s worst nightmare. Steph does not like to be threatened. Bo Dallas makes his way to the ring and recites an angry rhyme. 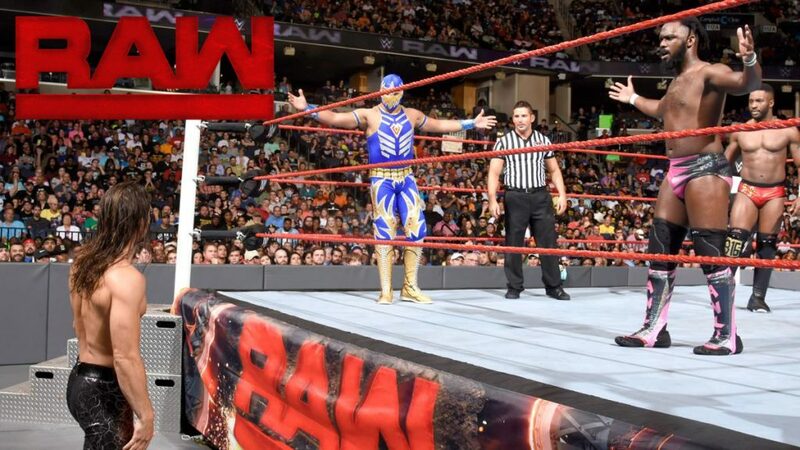 The cruiserweights are coming to RAW, tonight. Earlier today, Andrea D’Marco asked Sheamus about pressure. Sheamus says that he’s in the driver’s seat. Cesaro’s back became the focal point of this match. It worked very well for the match, but being less than a week away from a PPV, it made it almost inconceivable that Cesaro could lose. Of course the last match would be at the PPV. Even so, they did everything they could to swerve that thought. This was a good match despite the 99.9% chance that Cesaro would win. Foley talks on the phone to someone saying that match seven of the best-of-seven will be at Clash of Champions. Then Jericho shows up. He tells Foley that Foley never liked him. Foley says that’s an exaggeration. They agree. Jericho then talks about the “List of Jericho.” They insult each other’s fashion sense, but Foley gets the upper-hand. Already in the ring, Chris Jericho asks for quiet. He then starts to read the “List of Jericho.” Everyone will soon be on the list. Including Sami Zayn. As he’s reading, Enzo and Cass interrupt. Jericho adds Enzo and Cass to the list as they talk. Jericho calls out Cass on his dated references when the Shining Stars interrupt. Jericho adds them to the list. New Day comes out as the Stars speak. After New Days speaks, Gallows and Anderson come out. They remind New Day that they beat them last week. Jericho then makes a new list, a list of stupid idiots. Everyone in the ring is on it, but Sami Zayn runs out to attack. Not a bad match. As expected, a little over half way through it broke down and everyone started fighting in and around the ring. It helped to somewhat maintain interest in the New Day versus Anderson & Gallows match, though the Jericho versus Zayn match seemed to be the focal point. A video package featuring Gran Metalik and Rich Swann. Remembering Eddie Guerrero for Hispanic Heritage Month. Already in the ring, Mick Foley stumbles over his words to introduce the Cruiserweights. Very good match. It was a little one-on-one to start, but after some dives they all started to get in the ring together. I’m glad they gave these guys enough time to put together a good match. They showed a lot fun moves and nice moments. Stephanie, New Day, Charlotte and Sasha Banks visit kids at St. Jude’s. Pretty good match. Nothing particularly noteworthy, but it was fine. Owens started by trying to escape right away and kept going for the escape whenever he could. The finish was fine as well. After the match, Rusev runs out and attacks Reigns. As Reigns is beating up Rusev, Owens kicks the cage door into Reigns’ face. Rusev rolls Reigns into the ring and then locks himself, Reigns, and Owens in the cage. Rusev has Reigns in the Accolade when Seth Rollins runs down to the ring. Rollins leaps from the top of the cage onto Owens and Rusev to end the show. A fine show, pretty average. I like the tension between Stephanie and Mick. Mick’s making decisions that don’t really make a lot of sense, but I think that makes things interesting. I also liked the Cruiserweight segment, though I think TJ Perkins should definitely have been on the show. He should have done commentary on the Fatal Four Way or something. He was even on the RAW pre-show, but they decided to not have him be on RAW? That’s an odd decision. The main event was fine, but again, Foley’s decision for a cage match didn’t make much sense. I’m not a fan of throwing out stipulations just for the sake of having a stipulation. I mean, I get that it was a reaction to interference from last week and a cage supposedly keeps interference from happening, but when has that ever actually been the case? And putting the champ in a cage for no good reason just days before a PPV is not a good decision by the GM. I also thought it was kind of funny that Seth Rollins wasn’t even i the match but his actions in the cage overshadowed both Owens and Reigns. And on that note, I’m not fully behind the total babyface actions of Rollins. It seems like too big of a departure from his usual character too quickly. They could have built up to it a little better I suppose, but we’ll see where they go from here. I think the cruiserweights might steal the show every week if they’re given the time.